Mold is something you never want to find in your house, whether it pops up in plain sight or stays hidden inside walls and crevices. One of the most common ways that people discover that their home has a mold problem is through the smell; let’s take a closer look at what mold actually smells like, where mold odors are most common, and what to do when you want to remove a mold smell from your home. Yes: mold does smell. 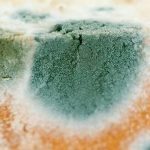 Mold has a distinct, unpleasant odor which can range from smelling musty to horrible depending on the type of mold, severity of the mold growth, and where it is growing. The reason why mold has a distinct smell is through the production of MVOC, or microbial volatile organic compounds. Some of these microbial volatile organic compounds are responsible for the “musty” smell that accompanies mold growth in the home. Most molds have at least a moderate “musty” smell, which is best described as an earthy, old, stale smell which may smell faintly like old, rotting leaves. Some types of molds have stronger smells depending on the type and level of MVOCs they produce, as well as where—and how big—the mold has grown. 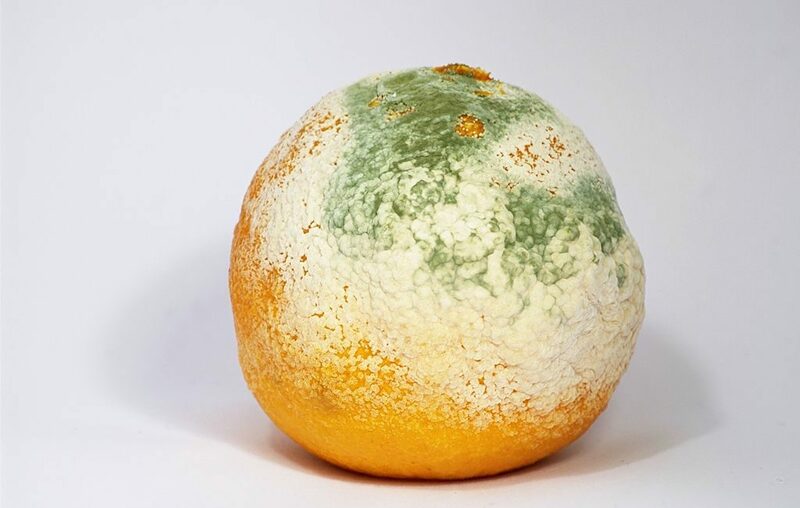 One of the distinct features of mold’s unpleasant scent is its persistence. It remains in the room or general area of the mold growth even if windows are opened or a fragrance spray is misted around the room. If you find that a room cannot lose its musty smell even after fresh air has been let in, you may have a hidden mold problem inside the walls or floors. 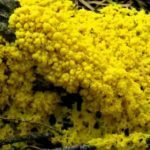 Black mold, like other molds, has a baseline musty smell; however, many types of black molds have a particularly unpleasant odor that goes beyond simple mustiness. Black mold tends to have an overpowering smell akin to rotting wood or paper, as well as a wet, dirty smells similar to old socks or other smelly clothing. Some strains of black mold, such as Stachybotrys, are known for smelling especially unpleasant whenever they grow inside a house. Even if you can’t see mold growing in your home, you will still be able to smell it. When mold grows inside of a home—whether it’s visible mold inside a bath tub or mold that’s hidden behind walls—it produces an unpleasant odor that will eventually become strong enough to be noticed by the home’s occupants. 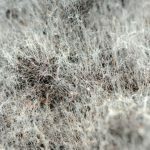 Mold’s unpleasant scent may be faintly musty and wet, or it could be overpowering like rotting wood or rotting leaves. The key to removing any mold odor from the home is first pinpointing where the odor—and thus, the mold—is located. The best way to do this is to walk through your home and gently inhale the scents around you in order to look for the “moldy” area or areas. The bathroom is one of the most common places for mold to grow due to the generally damp and wet environment of most modern bathrooms. A mold smell in a bathroom may appear to be coming from the room as a whole or it can be localized to a certain area or item in the bathroom, such as a sink or toilet. If you find that the room as a whole smells moldy, it’s important to check for signs of visible mold in common areas such as the tub, toilet and sink; hopefully, the mold problem is “visible” and not hidden behind bathroom walls. However, if you can’t find any signs of visible mold, it’s highly probable that the problem is coming from inside the walls, floors or even ceilings. 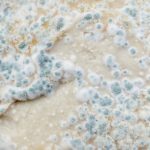 There is only one way to thoroughly get rid of a mold smell in your home, whether it’s in the kitchen, bathroom, or the living room wall: to remove the mold itself. If the mold is inside your walls, you will need to hire a professional to come take care of it for you; this will not only reduce the chances that your home is damaged, but ensure that the mold is properly and safely removed. If the mold is located in a specific visible area—such as the sink drain in the bathroom—then you can try your hand at at-home mold removal. Note: Always wear protective gear when cleaning mold. This includes professional cleaning gloves as well as a mask to ensure you don’t inhale mold spores while cleaning. Step One: Purchase a mold-killing spray; these can be purchased at just about any home goods retailer. The spray should be spritzed generously on the area in the home that is covered in mold–if you can, spot test the mixture in order to determine if it will stain the wood, porcelain or other material that the mold is currently growing on. Step Two: Let the mixture rest on the mold for at least 30 minutes. If the mold is particularly thick or stubborn, let it rest for at least an hour total. Step Three: Dip a hard bristle cleaning brush in warm, soapy water. Scrub the moldy area thoroughly until it is removed. Step Four: Use a blow-dryer to ensure it dries quickly and completely. Repeat as necessary in other areas with mold growth. Mold has a distinct, unpleasant smell that can range from a light scent of musty attic to full-blown rotting leaves. Due to mold’s unusual odor, people often detect mold in their home by taking note of an unpleasant smell that won’t seem to go away. If you smell mold in your home, you should investigate thoroughly to help determine the source and scope of the mold problem in your home. Once you know what you are dealing with, you can tackle the problem thoroughly to ensure your home is completely mold—and unpleasant mold scent—free.